Is a Self Service Password Solution Right for My Organization? You’re thinking about implementing a self-service reset password solution but you are not quite sure if it is worth it and will be of benefit to your organization. 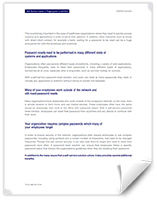 This whitepaper provides an easy checklist of issues your company might have as well as solutions to how a password reset solution can easily solves these issues in addition to saving you time and money. Read our white paper to see if a self-service password solution is right for you.